End of the Line; Minneapolis, MN | Flickr - Photo Sharing! MTC 106 at (which in 2009, was) the end of the line, at the Warehouse District / Hennepin Avenue Station, Minneapolis, MN. This appeared in the book, "What's Next? Getting Ahead of Change," by the Urban Land Institute. texasselvagem, AgentADQ, applegathc, and 9 other people added this photo to their favorites. Great colour scheme and urban setting! Is that a street-rail system, or more of a tram/light rail system? 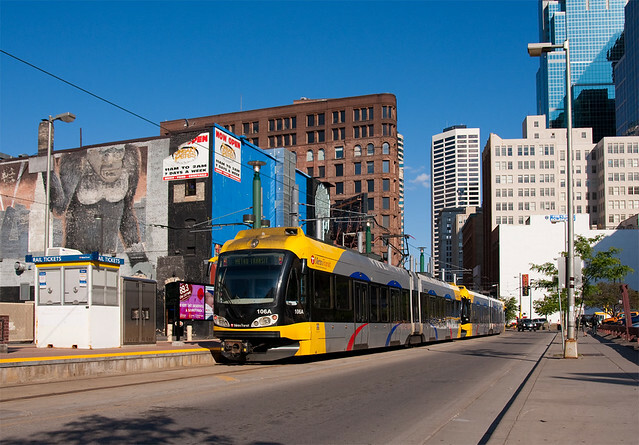 It's a lIght rail system connecting the Mall of America to the airport, downtown Minneapolis, and the Northstar commuter rail line.